The holidays are quickly approaching and we all love visiting relatives during this time of year. But sometimes, it&apos;s wise to let us handle the overnight stays. That way you bothcan relax and enjoy each other&apos;s company without straining your relationship! Withgood vibes, you now can spend some time with your relatives visiting the many restaurants, shops, and hidden gemstones that are Only in the AV. Checkout what&apos;s on The BLVD or see what seasonal events are coming up on our events calender. 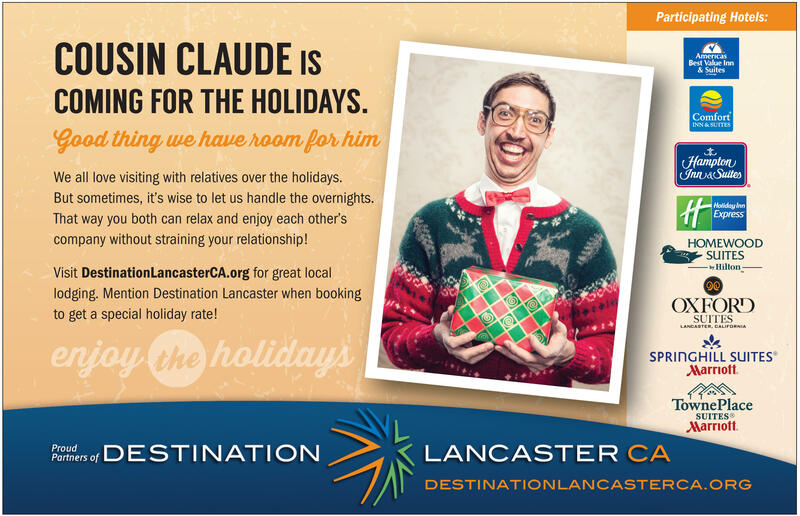 Mention Destination Lancaster when booking and get a special holiday rate! Rates range from $69 - $109 per night. Discounted rate good on selected rooms and based on availability for stays through December 31, 2014. Room rates listed below do not include taxes. Also if you book before December 5, 2014, you&apos;ll get a special gift!